Simon & Schuster, 9781451624434, 496pp. For decades, we have been told that the best possible diet involves cutting back on fat, especially saturated fat, and that if we are not getting healthier or thinner it must be because we are not trying hard enough. But what if the low-fat diet is itself the problem? What if the very foods we've been denying ourselves--the creamy cheeses, the sizzling steaks--are themselves the key to reversing the epidemics of obesity, diabetes, and heart disease? 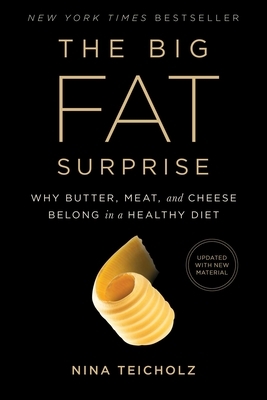 With eye-opening scientific rigor, The Big Fat Surprise upends the conventional wisdom about all fats with the groundbreaking claim that more, not less, dietary fat--including saturated fat--is what leads to better health and wellness. Science shows that we have been needlessly avoiding meat, cheese, whole milk, and eggs for decades and that we can now, guilt-free, welcome these delicious foods back into our lives.